W3C has a variety of mechanisms for listening to what the community thinks could become good future Web standards. These include discussions with the Membership, discussions with other standards bodies, the activities of thousands of participants in over 300 community groups, and W3C Workshops. 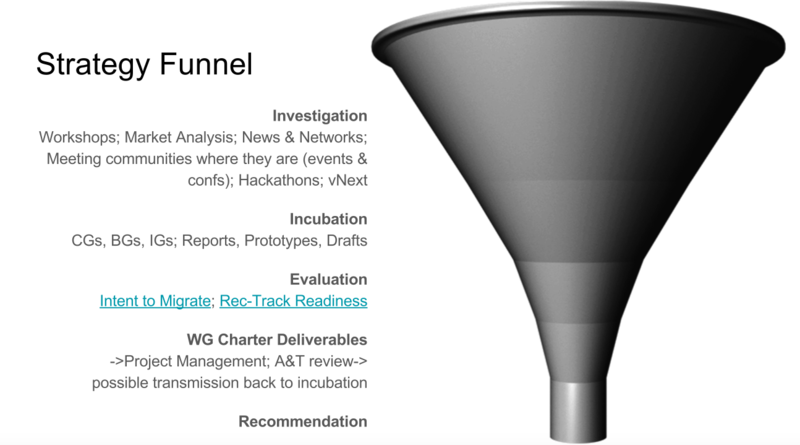 The Strategy Funnel documents the W3C staff’s exploration of potential new work at various phases: Exploration and Investigation, Incubation and Evaluation, and eventually to the chartering of a new standards group. The Funnel view is a GitHub Project where new area are issues represented by “cards” which move through the columns, usually from left to right. Most cards start in Exploration and move towards Chartering, or move out of the funnel. Public input is welcome at any stage but particularly once Incubation has begun. This helps W3C identify work that is sufficiently incubated to warrant standardization, to review the ecosystem around the work and indicate interest in participating in its standardization, and then to draft a charter that reflects an appropriate scope. Ongoing feedback can speed up the overall standardization process.